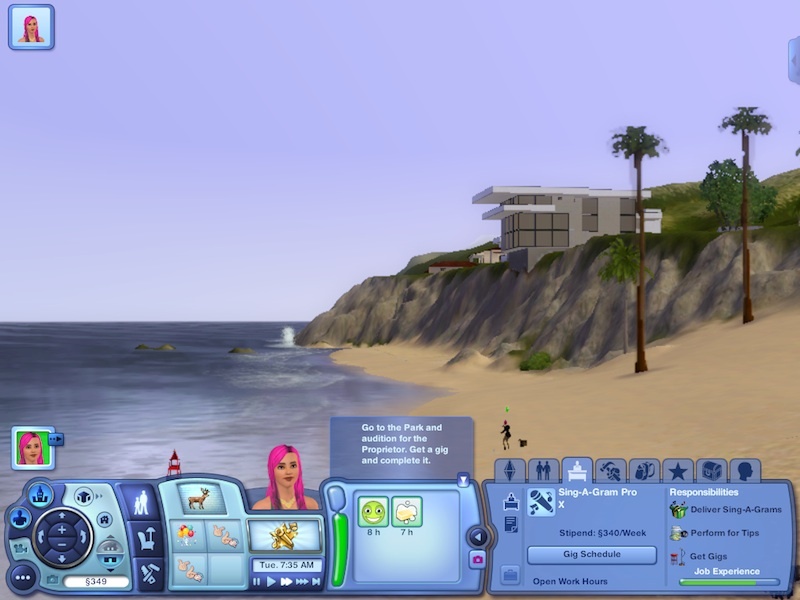 The Sims 3 has given players the opportunity to send their Sims on adventures, spend as many nights out on the town as they can handle, fill their homes with pets and kids, and work their way up various career ladders. And Showtime allows them to rise to stardom with three fun new professions. 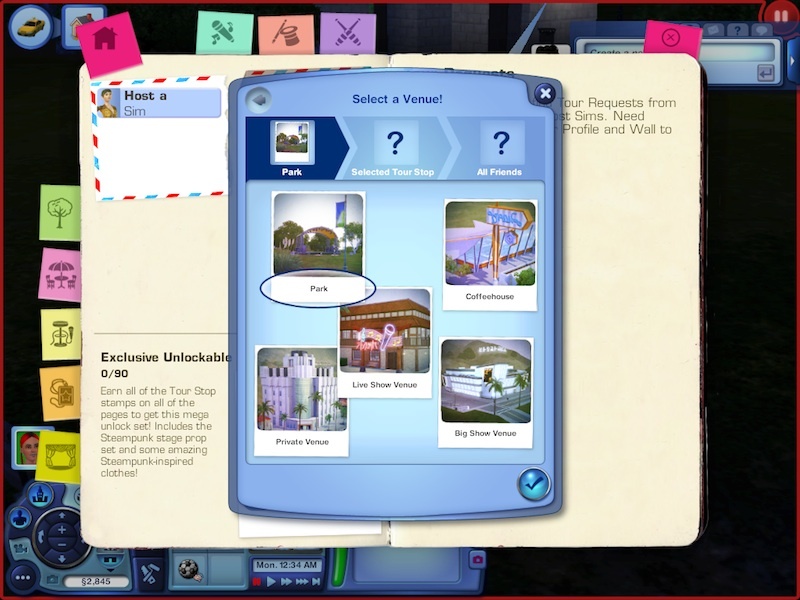 The expansion pack also enhances game play in a number of ways, and brings back a few beloved objects from past Sims games, as well as some new ones. 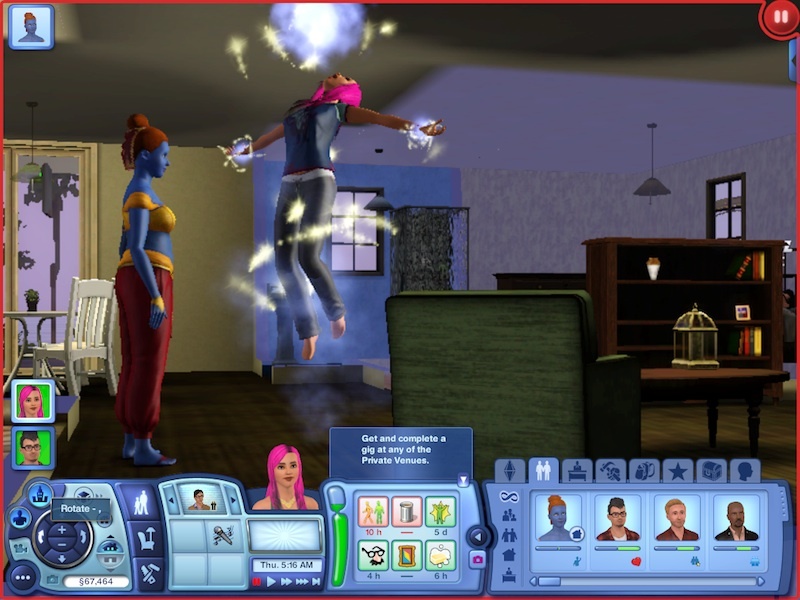 Note: Just a reminder that Showtime is an expansion pack for The Sims 3. 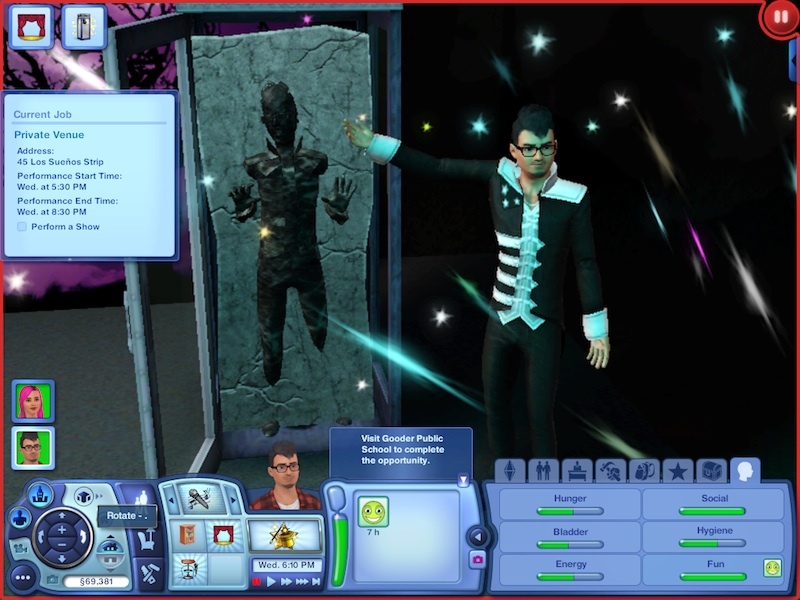 It requires the Sims 3 base game to play it. I reviewed this on a MacBook Pro with OS X Lion. The three new professions added with Showtime are singer, acrobat, and magician. I found out early on that, little to no skill is involved in getting into these professions. 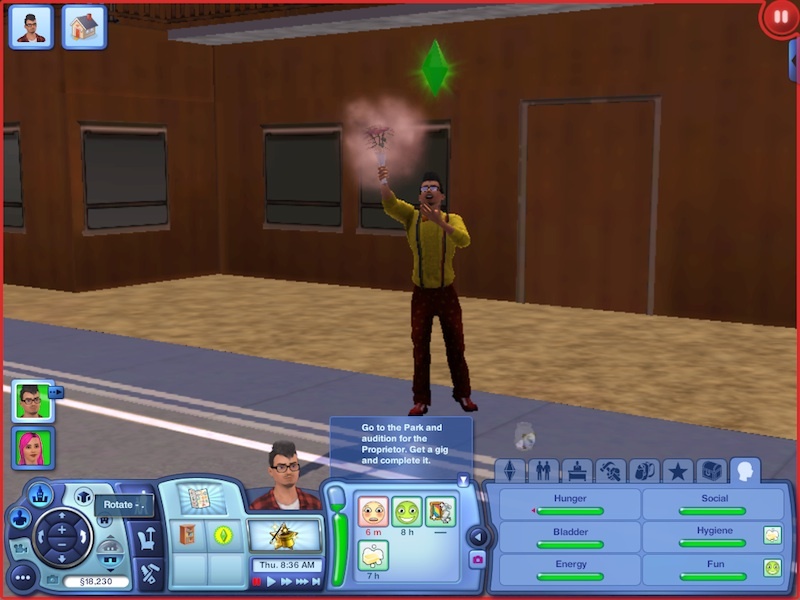 Your Sim just has to sign up for the career (my Sim used the newspaper), and then begin by singing, doing magic, or miming for tips in public places to start earning some money and experience. 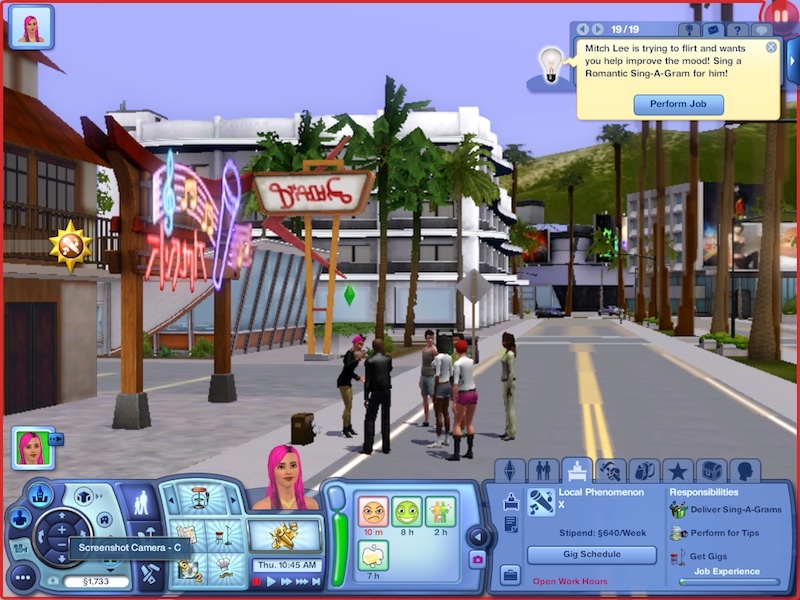 Much in the way Ambitions professions offer Sims the opportunity to run all over town doing jobs during working hours, Showtime is set up similarly. For example, a singer can perform “Sing-a-Grams” to individuals to gain money and experience. 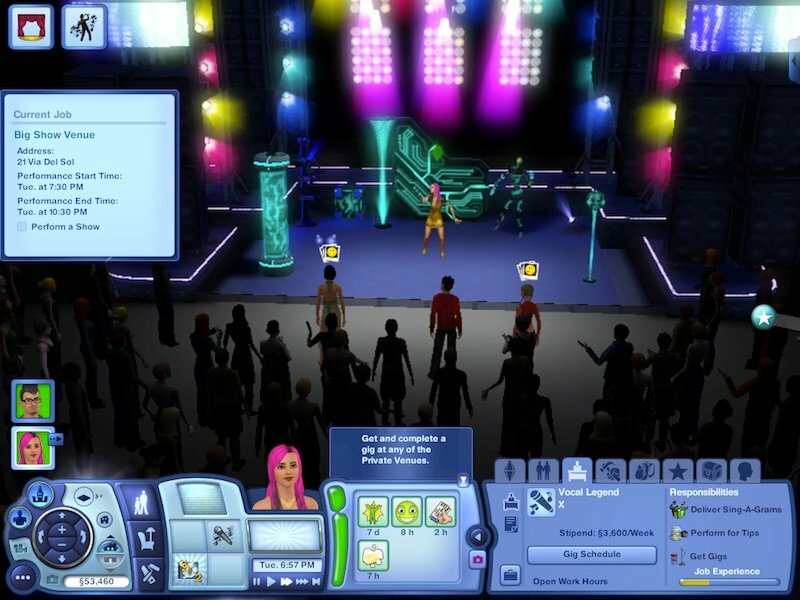 Singers will slowly build onto their catalog of songs, and can sell albums in addition to performing for tips or on stage. Magicians have some basic tricks, and can work their way up to the bigger tricks like the Box of Mystery and Box of Danger. And Acrobats start off doing mime tricks and work their way up to more impressive stunts, including the Balancing ball and Giant Ring of Fire. 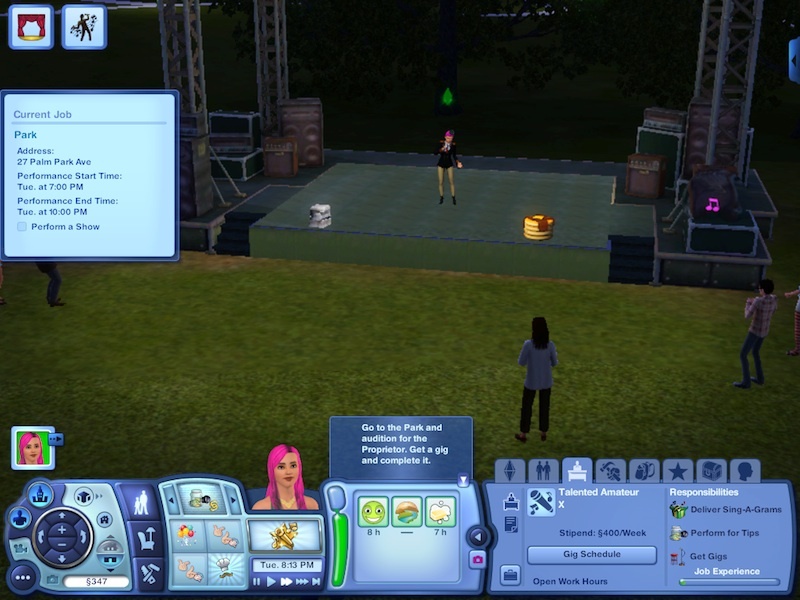 As a Sim works their way up their professional ladder, they can go on venue auditions and perform in front of audiences. The great thing about this is the lack of rabbit-holes. As far as I’ve seen, all performances, including the big venue performances, are viewable. 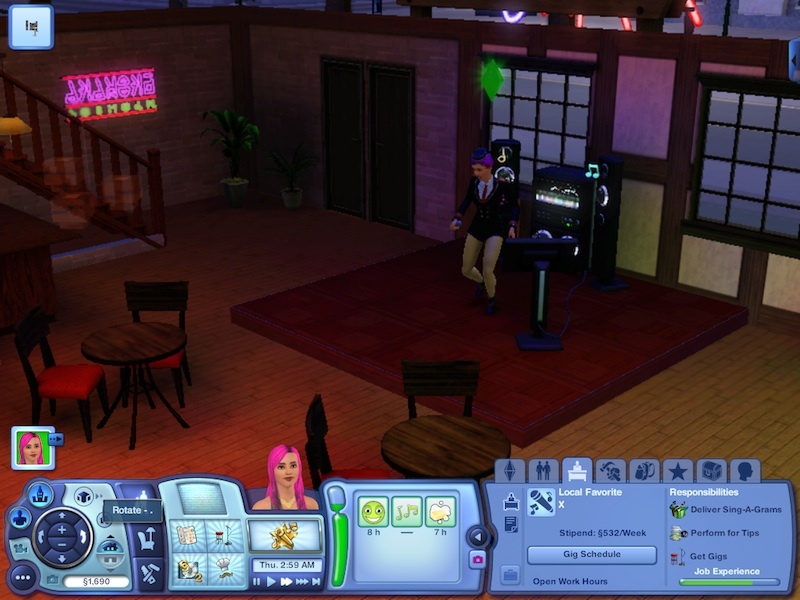 You can follow your Sim right into the club, hall or stadium and watch their act. And player participation is pretty flexible. 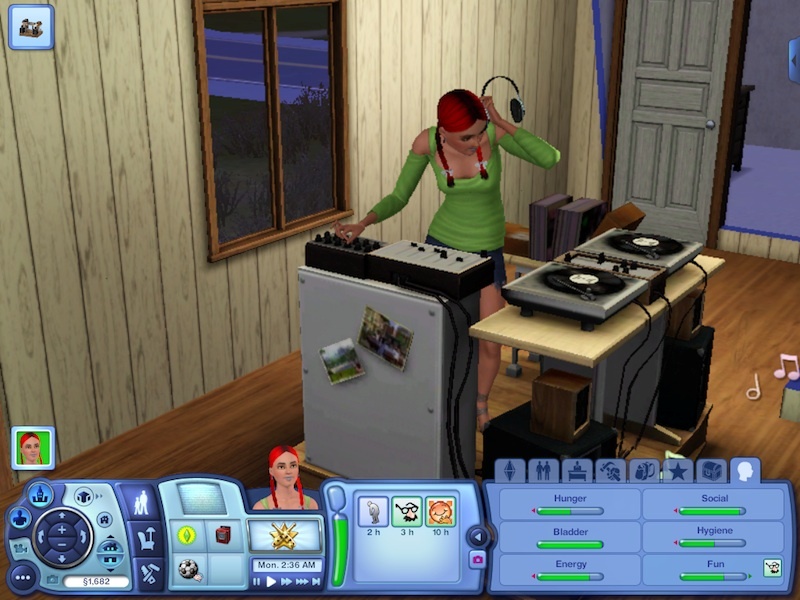 You can choose which stunts or songs your Sim performs while on stage, or you can let them choose for themselves. You just have to get them to the venue in time for their gig. They can also decorate the stage, and save the stage set-up for later shows. 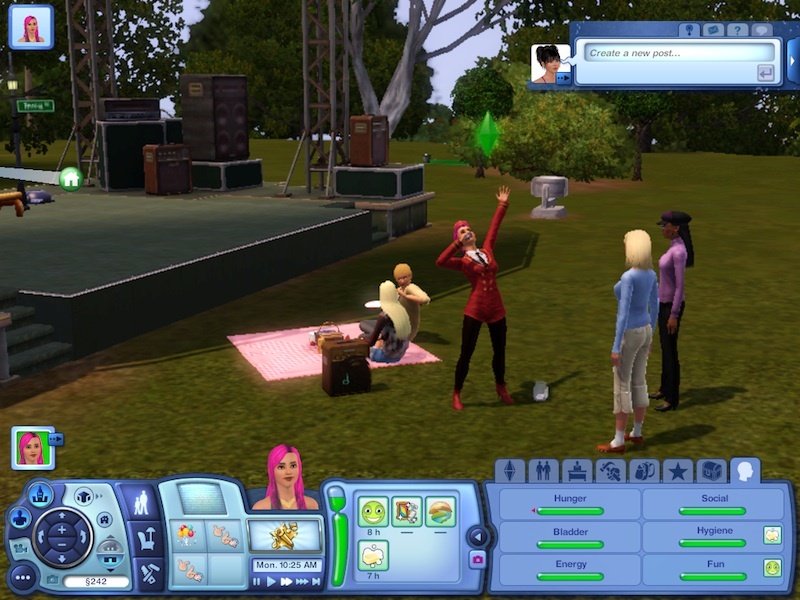 Sims can also win trophies by performing in Simfests (staged festivals that take place randomly around town). 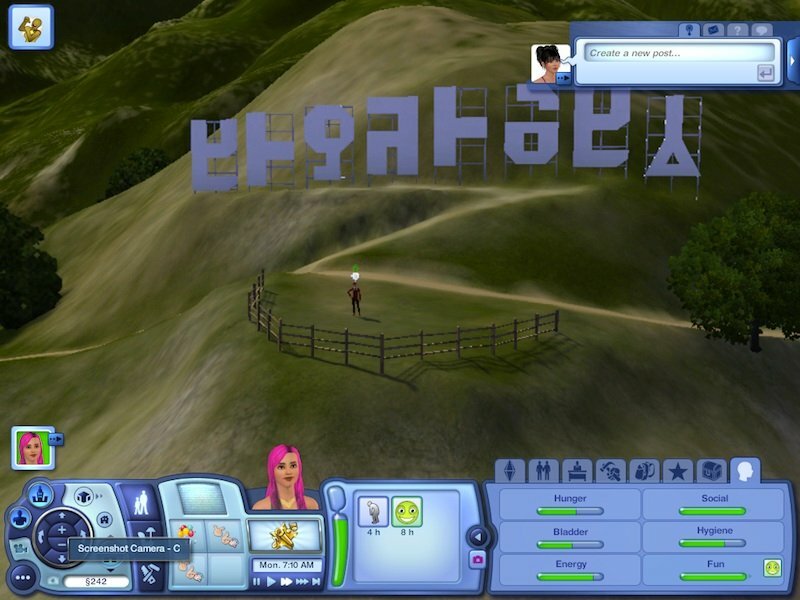 My Sim reached the top of the singing track. In addition to having numerous songs available to sing, she was also invited to perform at venues, and offered regular weekly gigs. She’s so wealthy from the big-venue gigs, which pay off nicely, that she really doesn’t need to go on auditions anymore. 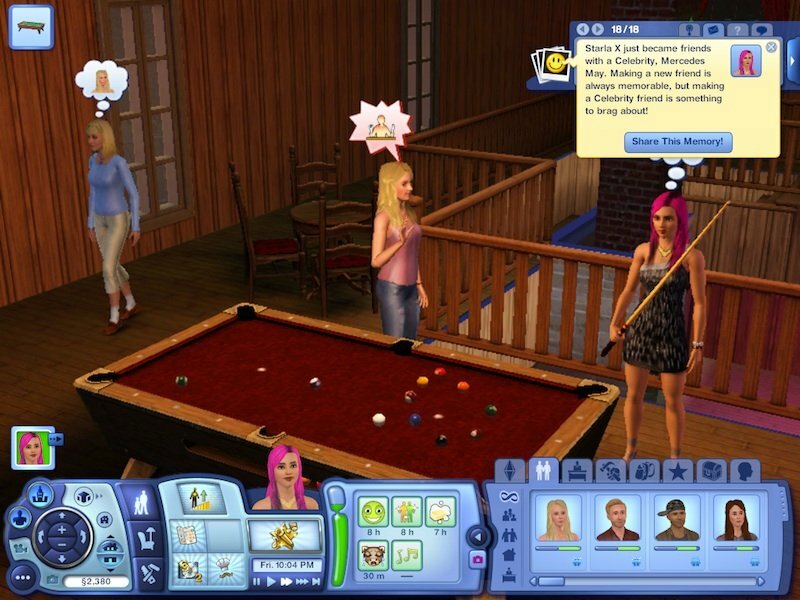 Previously, The Sims 3 began to make more use of the online community through the Exchange, which allows players to share custom Sims, lots and objects with each other. 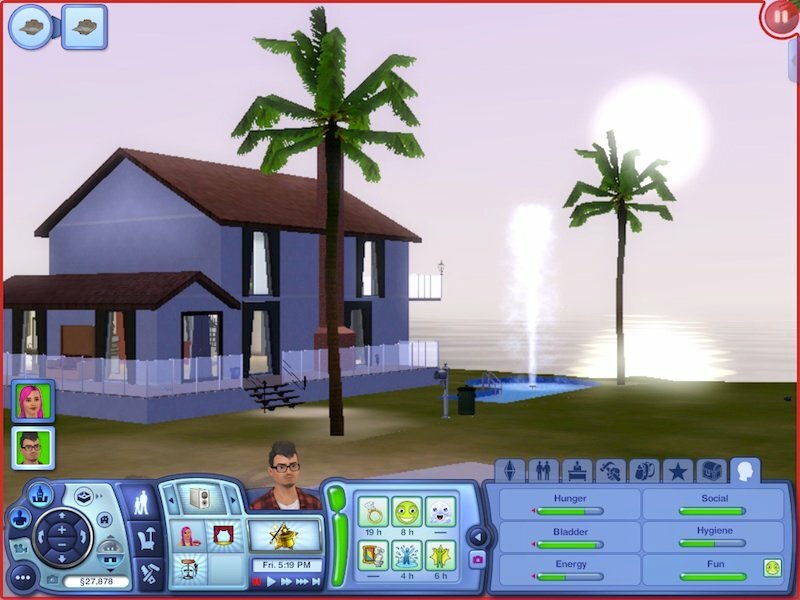 We’ve also been given the option to share photos and videos from our games through our TheSims3.com online profile. 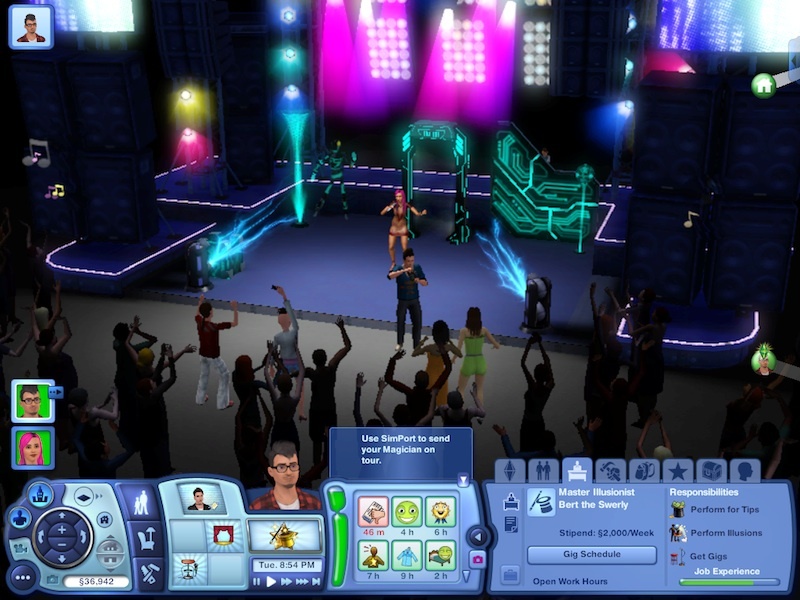 Showtime offers a number of upgrades in the way of interacting with other players, and participating in the online Sims 3 community. This means logging in as part of the start-up process. 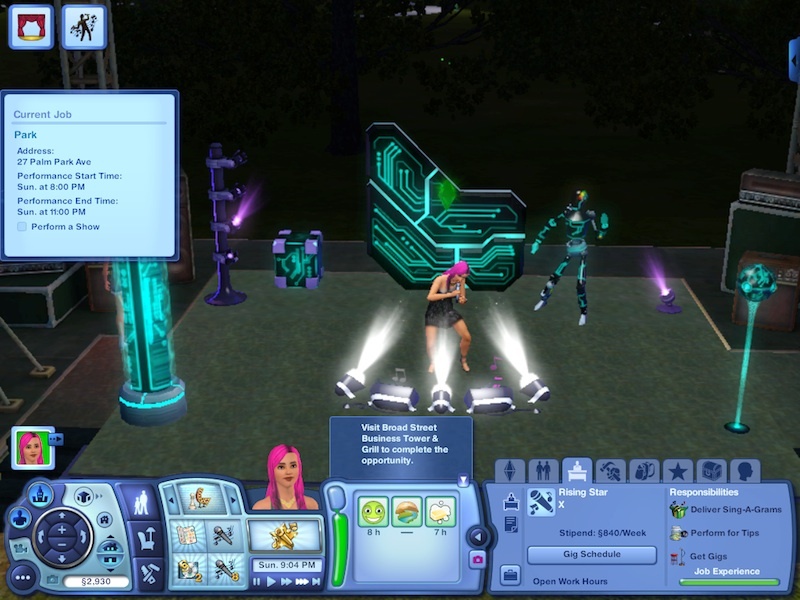 Players with internet access can use the new SimPort feature to take their Sims performance career to the next level. SimPort combines the new professions with the opportunity to interact with other players. 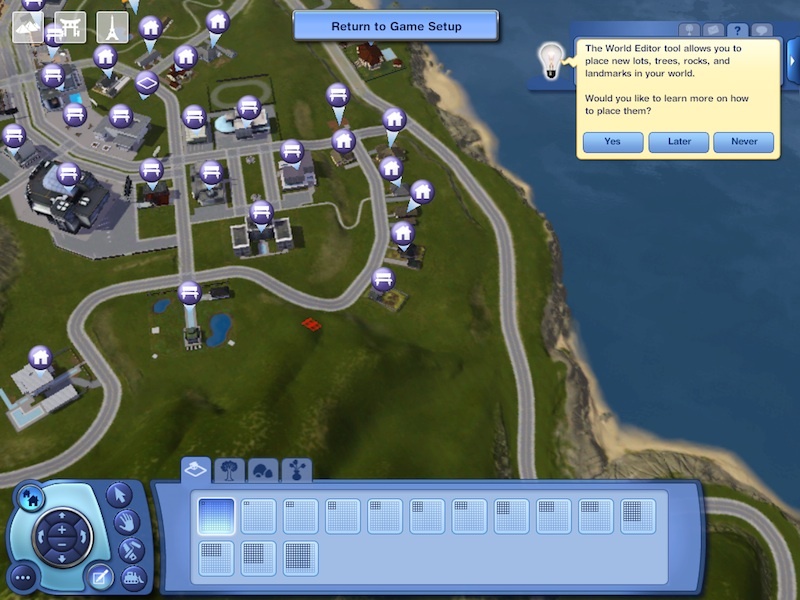 This optional feature is set up so that you can send your Sim “on tour” to another game or host a friend’s Sim on tour in your own game. 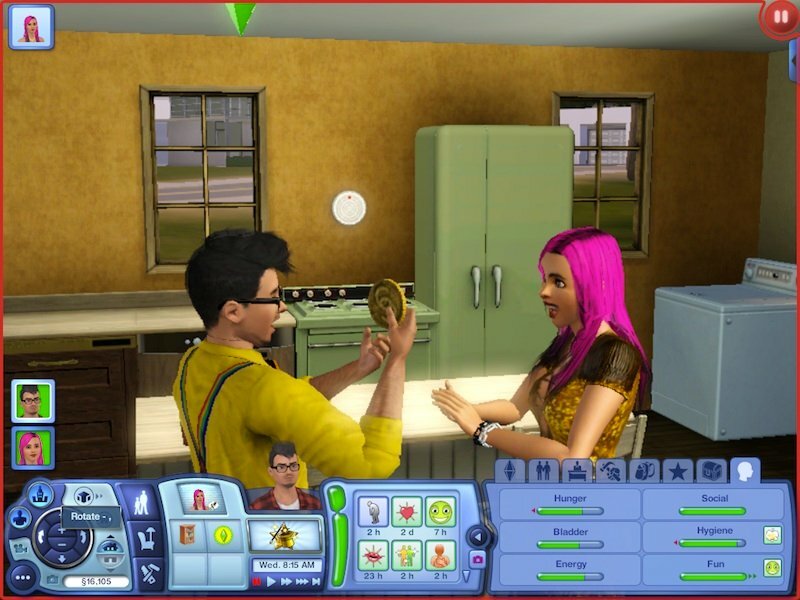 It’s a fun way for players to interact with each other and show off their talented Sims. 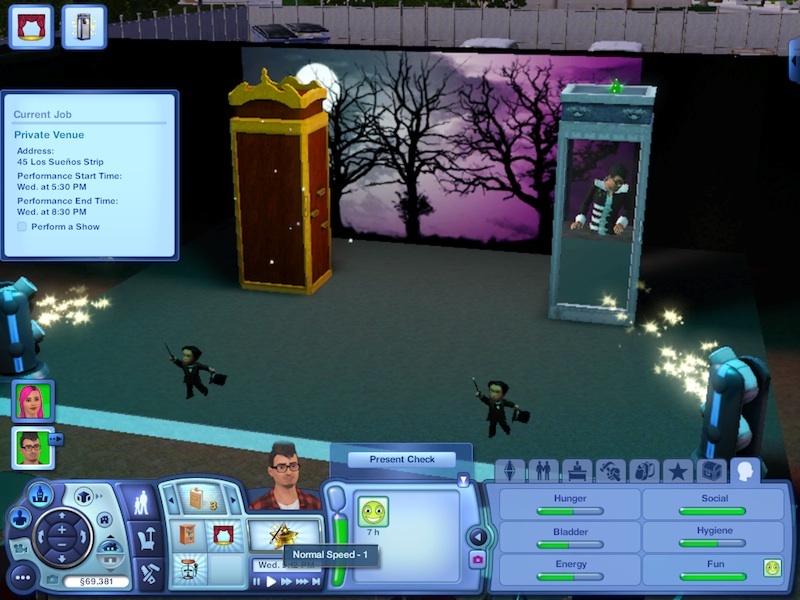 Sims can earn tour stamps for playing venues in other players’ games, receive reviews for their performances, and if they unlock all of them, they can earn stage objects and clothes. 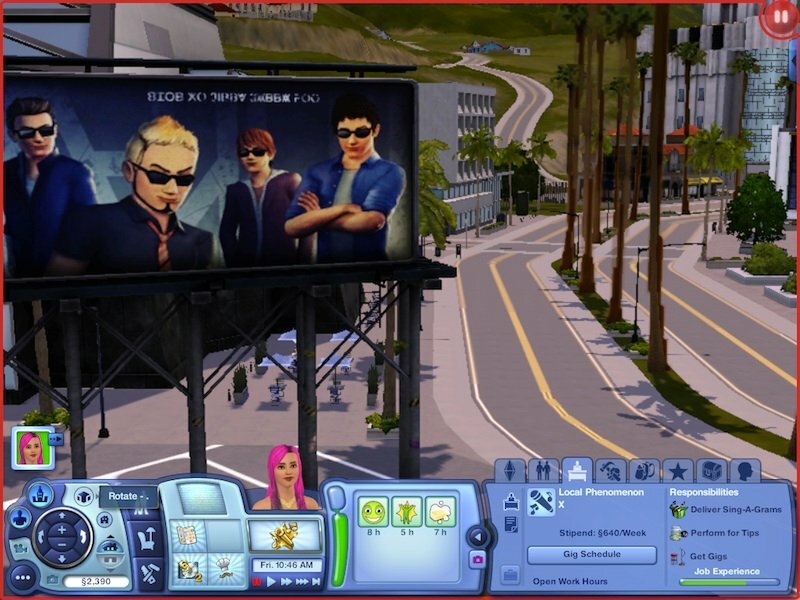 In addition to touring through SimPort, players can also access their friends online profiles through the game now, and search for new friends in-game. There’s also a sort of Status Update option that allows players to post on your Player Wall, and read other people’s updates. 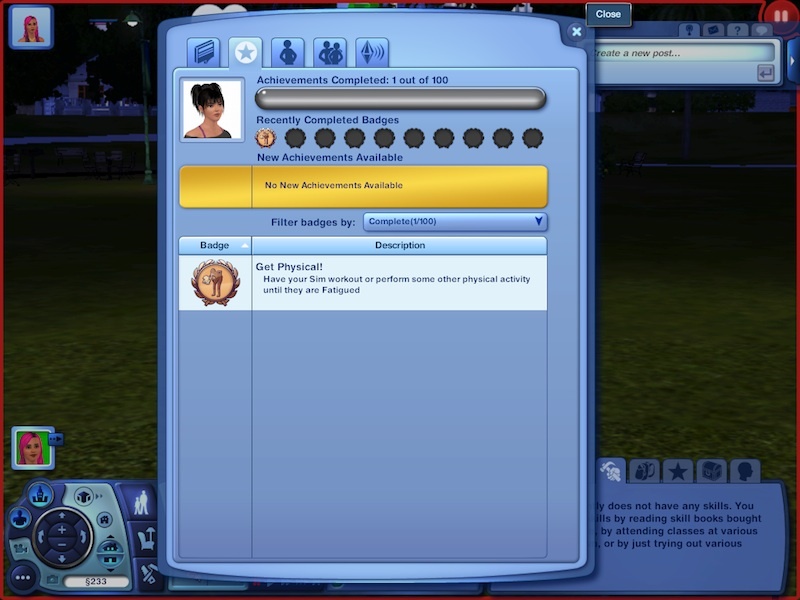 And finally, there are achievements players can earn, which seems a bit closer to console game-playing style, but also fits the obvious step toward a more interactive game-play experience for The Sims 3. 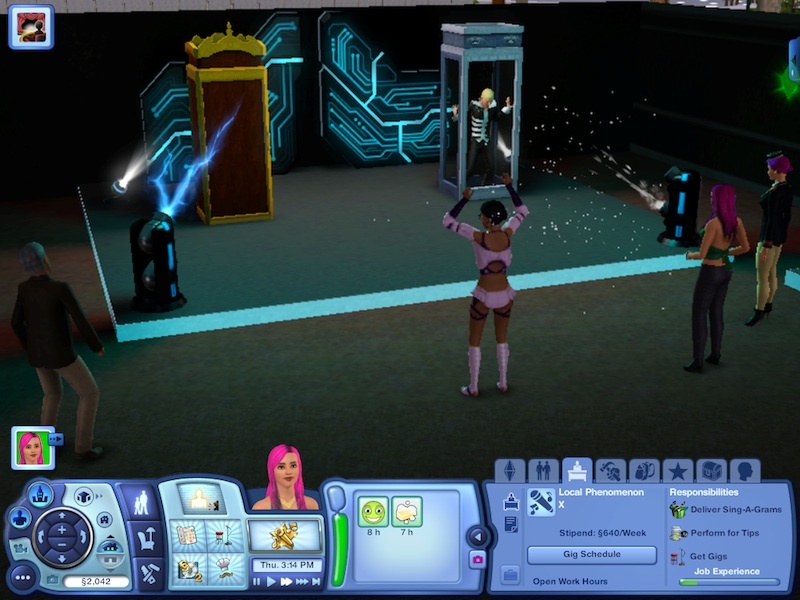 And because all of this is optional, those who have no interest in making their Sims game a shared experience should basically just ignore it without having it affect their game. New objects! - Remember the pool table? The DJ booth? What about the photo booth? 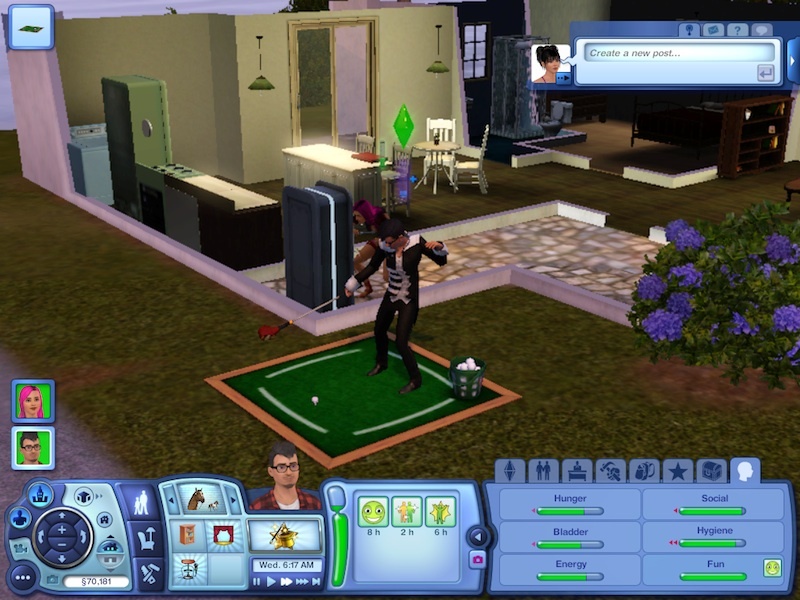 Showtime brings those back, plus there’s a mechanical bull, some cool new juke boxes and arcade games, and some other things for your Sims to play with, including a small putting green. ? 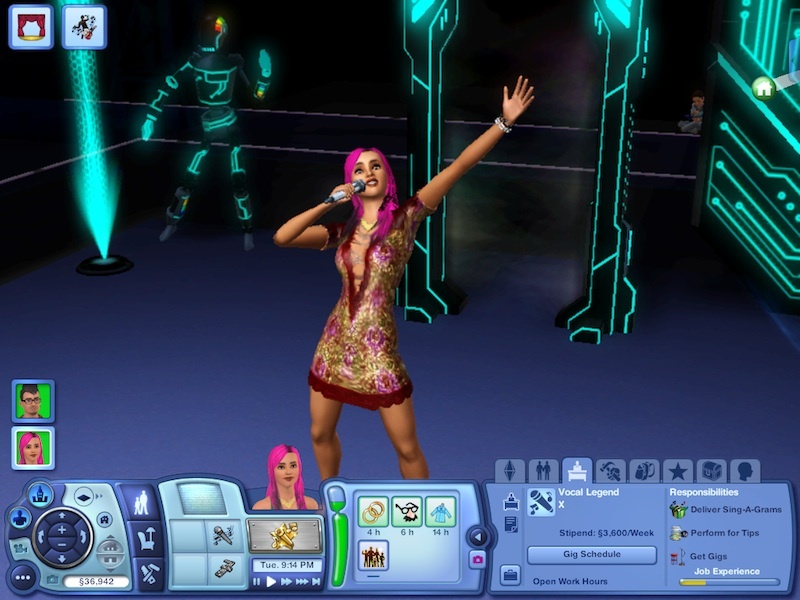 There are some new clothes and hairstyles to dress your Sims up for their shows. There’s also a great bunny-suit pajama set (ears in the hair section) for guys and girls, and a swim-cap, which I sort of love, for no reason in particular, other than because I like setting my Sims hair to match their outfits. 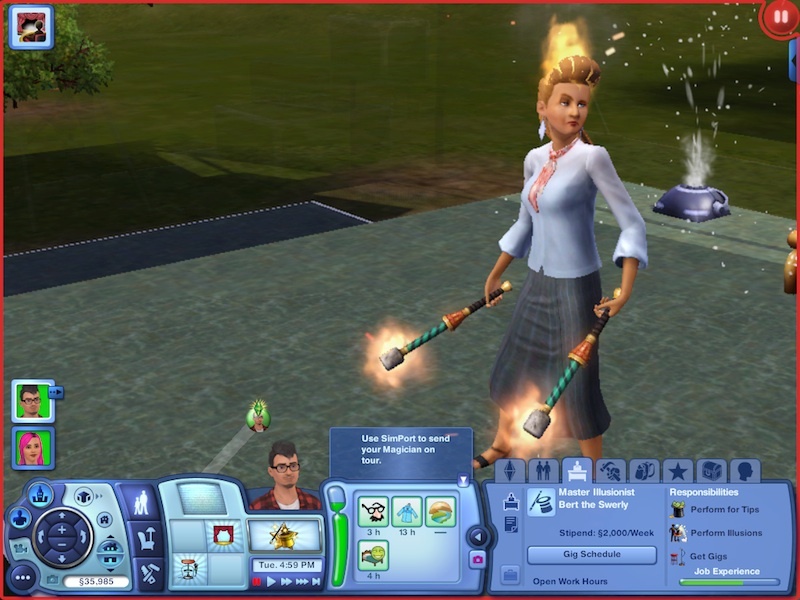 New traits and Lifetime Wishes - The new professions offer new lifetime wishes for Sims to pursue. 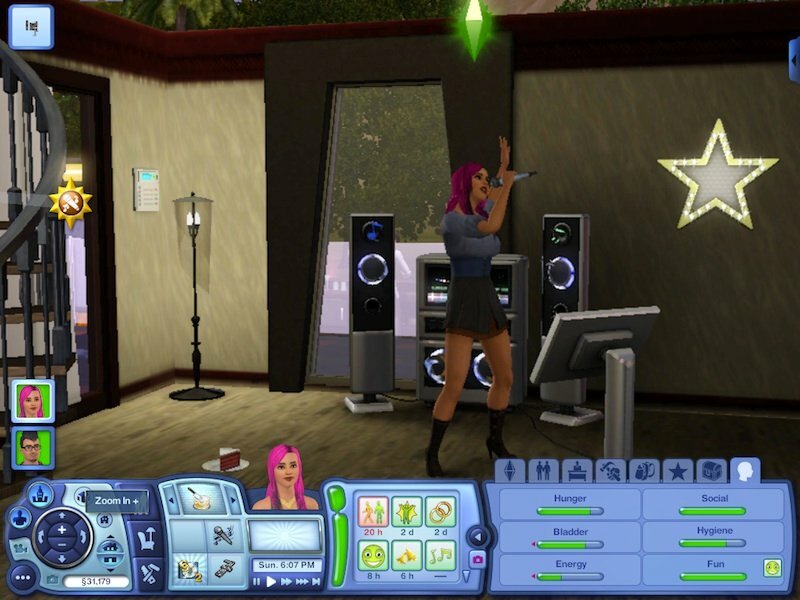 My singing Sim managed to reach the top of the Singing profession, which took her to her Lifetime Wish and earned her plenty of Lifetime Rewards, including the genie lamp (more on that in a minute). 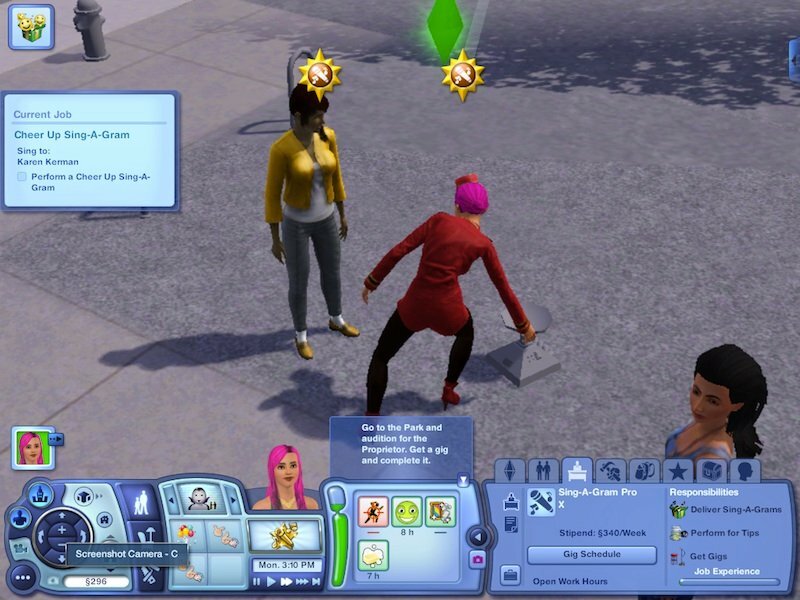 The new traits are Diva (gives your Sim an appreciation for drama, and some sassy behavioral options.) 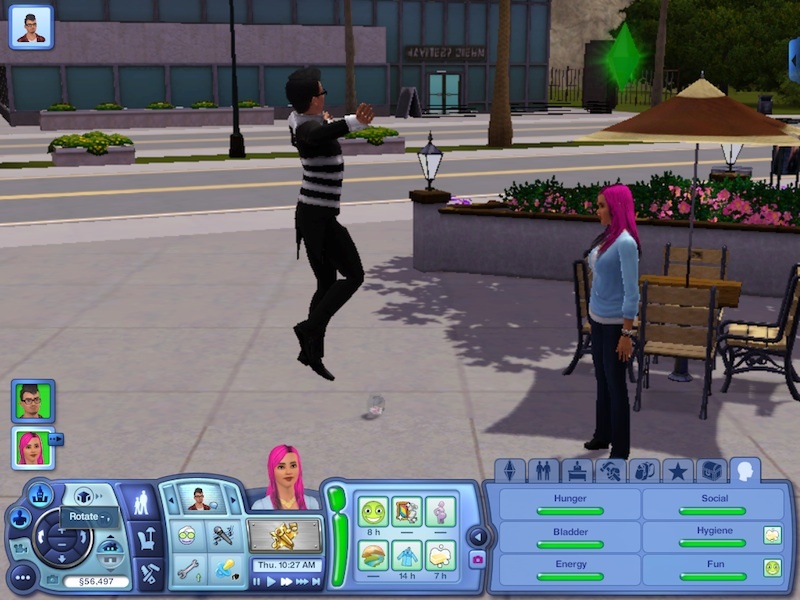 Natural Born Performer (Sims pick up performance skills faster), and Social Butterfly (Sims love to be the center of attention). 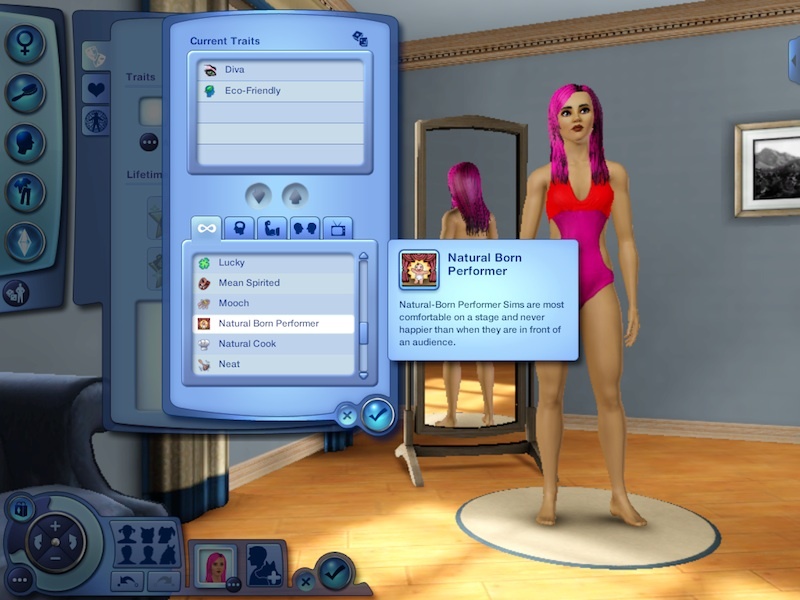 As you can imagine, all three traits work well for performer Sims. 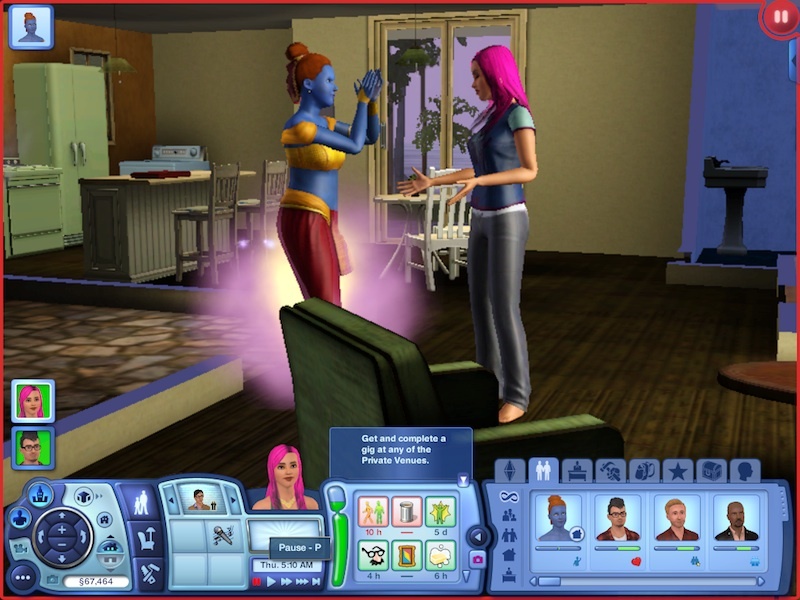 Genie - Much in the way previous EPs have brought in a new type of person for Sims to interact with (Mummies, Vampires, robots, etc), Showtime introduces the Genie lamp, which grants a Sim three wishes (listed in a set of options). 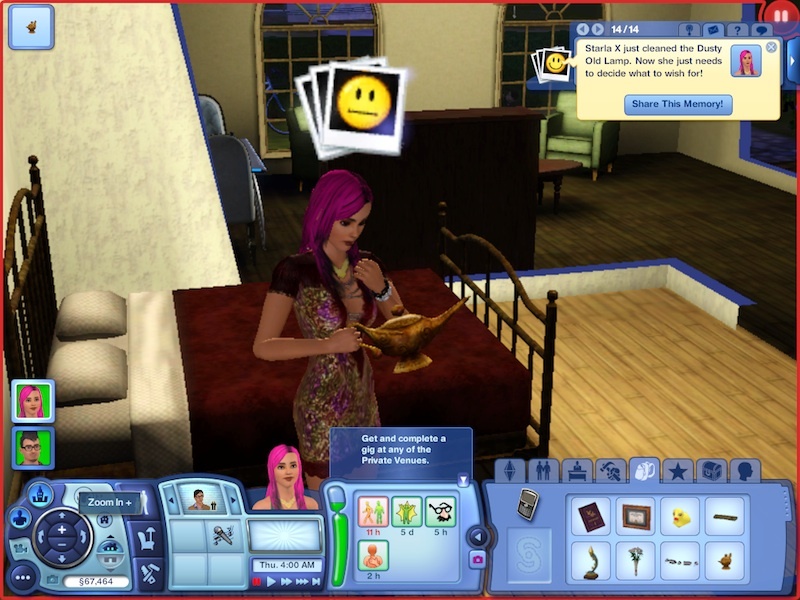 Rubbing the lamp brings the genie out, after which the Sim can interact with it, hang out with it, get to know it, and if they choose, wish to free it. There’s a process to freeing the genie, but I wasn’t able to get past the first step (put the lamp in the refrigerator). Not sure if this was a glitch in my game or something that’ll fix itself, but I didn’t have the option to drag the lamp into the fridge as instructed. I’m definitely interested in getting to play a freed genie though. In the meantime, my Sim did wish for a large family, and when she had her first baby, she had triplets. 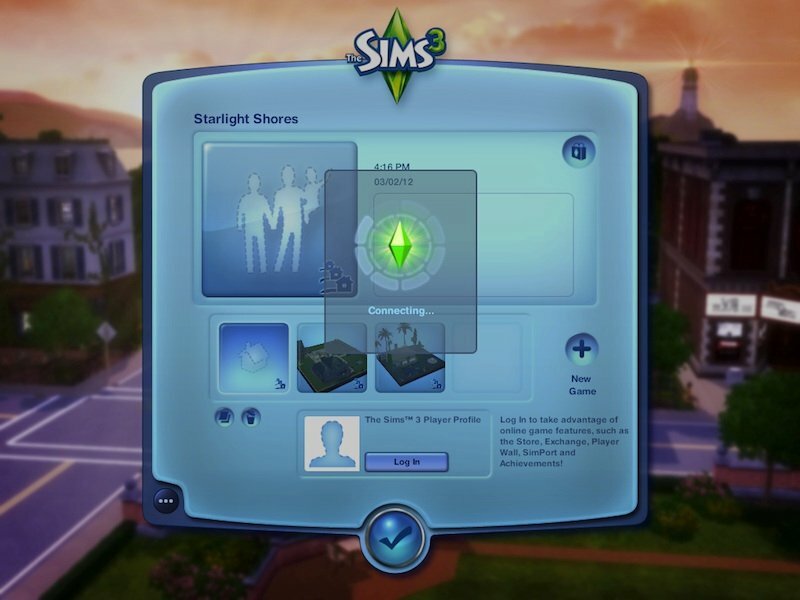 Starlight Shores - The new world that comes with the EP is Starlight Shores, a colorful, sunny, Hollywood-type world that even has a Hollywood (in Simlish) sign up on a hill. The biggest bonus to the world is that we can now add lots. This may be something offered with the latest update, and it’s definitely a huge addition to the game, for those of us who have wished that we could add lots of varying sizes to worlds pretty much since the base game was released. Showtime offers some nice additions to the game, the two biggest being the performances and the interactive features for people who want to add some online elements to their game-play. 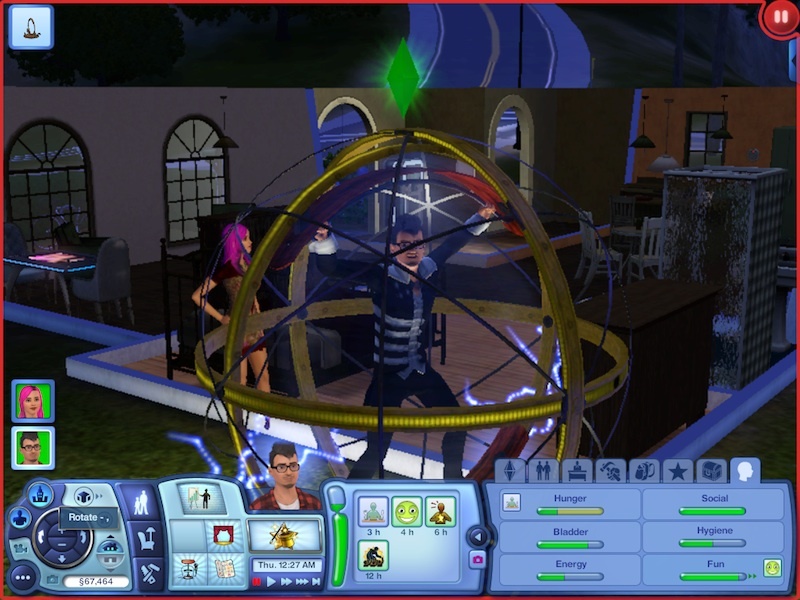 Between the new professions, the SimPort feature, the new world, and all of the added objects, Showtime is an above-average expansion pack, with some thought-out additions to the game. 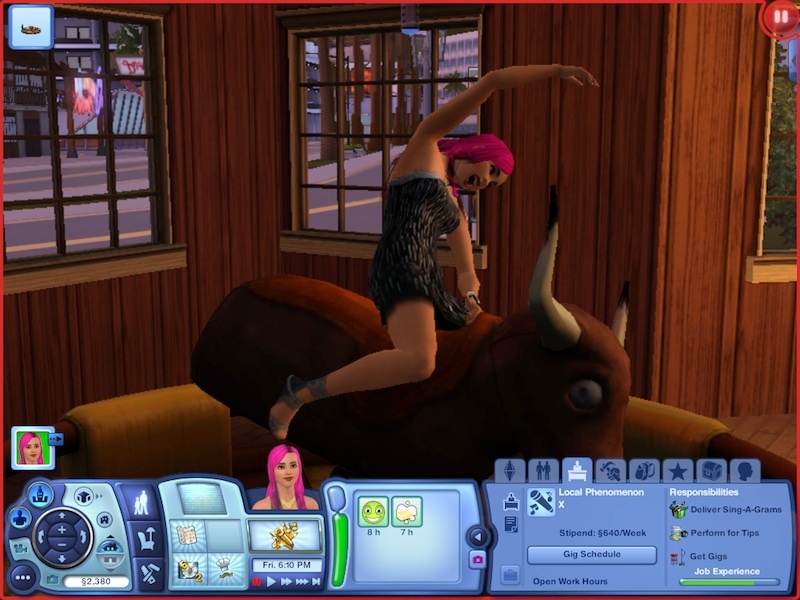 You’ll find plenty of screenshots in the gallery below. Unfortunately, since the in-game photo feature doesn’t work in my game (and hasn’t for at least the last couple of updates), all of the photos are screen-grabs.